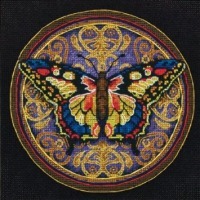 Butterfly Needlework Kits and Supplies - Cross stitch, needlepoint, latch hook and more. 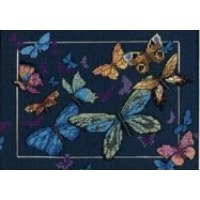 This page features butterfly needlework kits and supplies categorized for your shopping convenience. For more information about an item, simply click the item or text link. 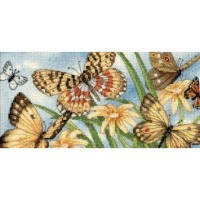 10" x 16" - A profusion of colorful butterflies and blooms comprise this exquisite counted cross stitch design. Kit contains cotton thread, metallic thread, 14-count ivory Aida, color-coded thread sorter, needle, and easy instructions. 8" x 10" - Kit includes 28 ct Even weave, embroidery floss, floss separator, needle and trilingual instructions. 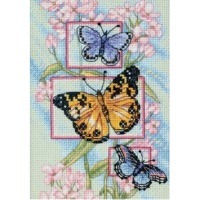 11" x 11" - kit contains 14 count Aida; 100% cotton thread; thread sorter; needle and easy to follow instructions. 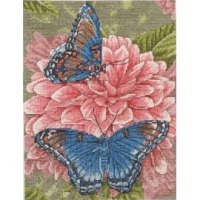 14" x 9" - Worked in counted cross stitch, our Field of Butterflies is sure to bring a breath of fresh air to your home decor. This design features colorful shades of thread and exquisite detail. 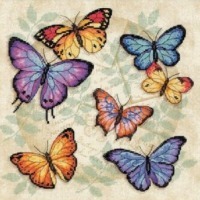 11" x 11" - Bursting with color, a grouping of butterflies dances across a printed background. Half Cross Stitch is used to create the soft leafy background around these winged beauties, and blending filament adds sparkle to their wings. Kit contains cotton thread, blending filament, 14-count printed ivory Aida, thread palette, needle, and easy instructions. Comes with complete instruction. 10" x 10" - This striking, dramatic design is authentic in its details and universally appealing. 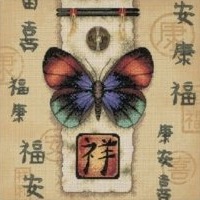 Its characters wish the viewer such blessings as health, happiness and good fortune. Kit contains cotton and metallic threads, printed 14-count beige Aida, thread palette, needle and easy instructions. 7" x 5" - Flittering, fluttering, nature's beauties dance across the fabric. The inky darkness of the navy Aida artfully contrasts with the jewel-like colors and flashes of silver metallic thread and blending filament. Kit contains cotton thread, binding filament, 18-count navy Aida, needle and easy instructions. 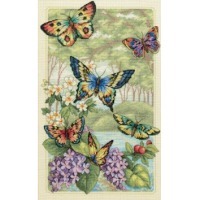 8" x 4" - Butterflies-so delicate, so exquisite-who can resist their beauty? 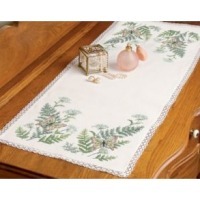 Kit contains cotton thread, 18-count ivory Aida, needle, and easy instructions. 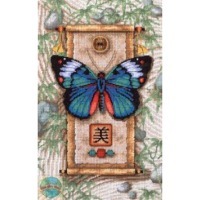 10" x 8" - Our colorful butterfly makes quite a statement, and the coordinating mat makes the perfect finishing touch for this design. This kit includes 14-count ivory Aida, cotton thread, and a precut printed mat. 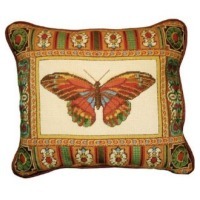 6" x 6" - Our colorful Gold Collection butterfly makes quite a statement. 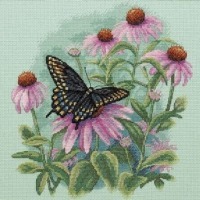 Kit contains cotton thread, 18-count black cotton Aida, needle, and easy instructions. 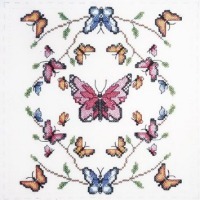 6" x 6" - Want to learn counted cross stitch? 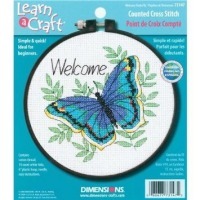 This bright, beautiful butterfly is the perfect project for a beginner. The Kit contains cotton thread, 14-count white Aida, 6-Inch plastic hoop, and needle. Makes a great Christmas stocking stuffer! 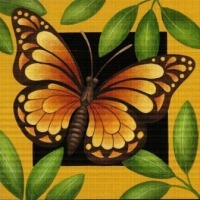 6" x 6" - Create a needlepoint canvas for a trivet with this pretty Butterfly by Stephanie Stouffer! Kit includes 14 mesh mono deluxe needlepoint canvas, a print, a needle, all the pearle cotton threads needed to complete and a wooden trivet holder (needlepoint canvas slides into the trivet case with glass top like a photograph does in a frame). 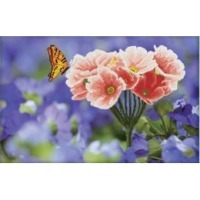 17" x 14" - Design printed in full color on 14 count 100-percent cotton mesh canvas. 100-percent cotton floss completes kit. 5" x 5" - This kit contains full color printed 12 mesh canvas; cotton embroidery thread; needle and easy to follow instructions. 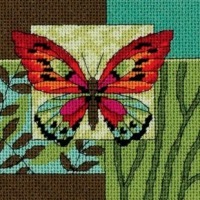 5" x 5" - This stunning butterfly design stitches up quickly. 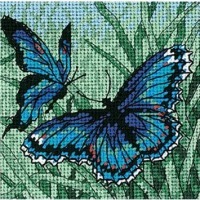 Kit contains cotton thread, full color print on 14 mesh canvas, and needle. 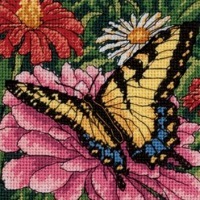 5" x 5" - Our Butterfly on Zinnia design in needlepoint is a beautiful close-up of flora and fauna. 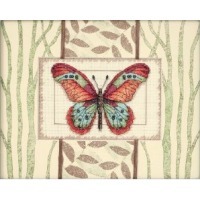 Quick to stitch, this stunning celebration of nature can be finished with a mat and frame for grander look. Kit contains cotton thread, full color print on 14 mesh cotton canvas, needle, and easy instructions. 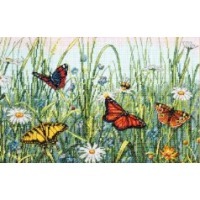 28.3" x 19.7" - 11CT Aida Cloth with printed background by Active Printing & Dyeing Technology, only certain parts & area required to stitch, and everything (Floss, Needle, Instruction, graphic chart) you need to complete this cross stitch project. 18.9" x 18.9" - 11CT Aida Cloth with printed background by Active Printing & Dyeing Technology, only certain parts & area required to stitch, and everything (Floss, Needle, Instruction, graphic chart) you need to complete this cross stitch project. 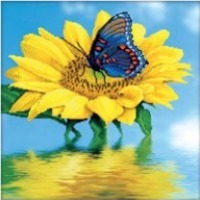 18" x 18" -Makes a beautiful quilt or wall hanging. Thread kit contains enough DMC floss to stitch 6 quilt squares. Kit Includes: Six 18" quilt squares. 20" x 30" - Delicate ferns and Queen Anne's lace provide the woodland tracery backdrop for two fluttering beauties. The package contains a pair of pillow cases printed with ink that fades with washing and complete instructions that include a shopping list for thread. 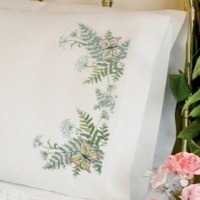 14" x 37" - Grace your dresser with delicate ferns and Queen Anne's lace sparked with two pastel beauties. The package includes fabric printed in ink that fades with washing and the lace trim for finishing. 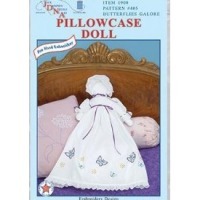 Each package contains 1 pillowcase skirt and doll pattern of cotton/poly broadcloth, instructions for completion and care, and complete floss requirements. 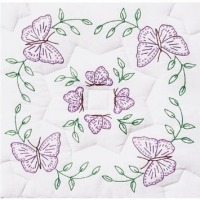 18" x 18" - Stamped Embroidery: Quilt Blocks: 6pc. Each package contains (6) 18x18" quilt blocks of cotton/poly broadcloth, instructions for completion and care, and complete floss requirements.